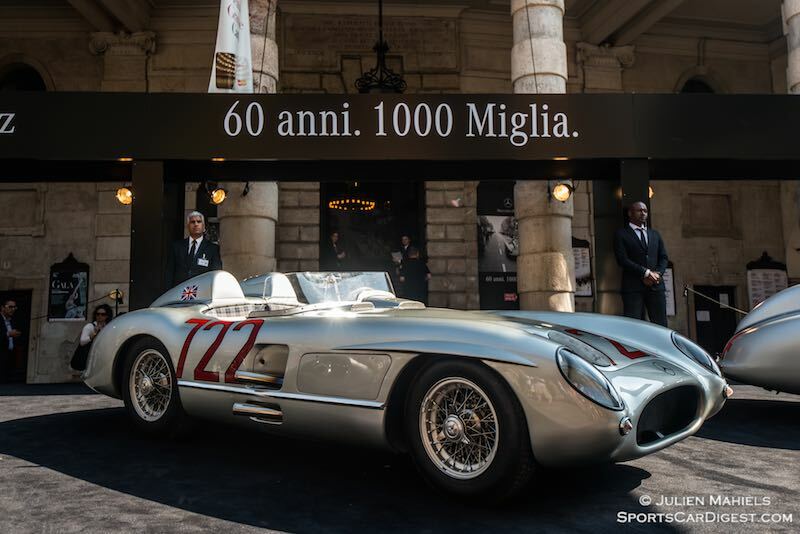 At the 2015 Mille Miglia retrospective, Mercedes-Benz celebrated the 60th anniversary of its famed overall win at the 1955 Mille Miglia. 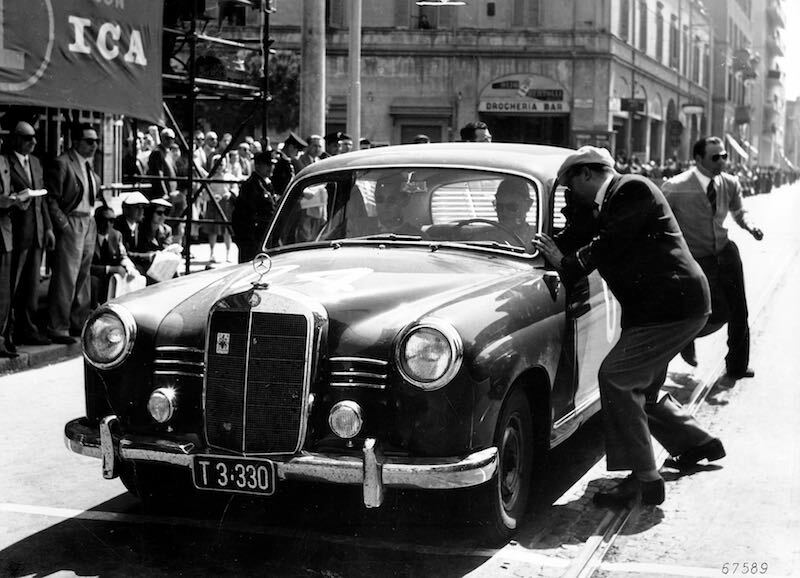 Three of the greatest heroes of the thousand-mile race in 1955 returned to the route between Brescia and Rome. 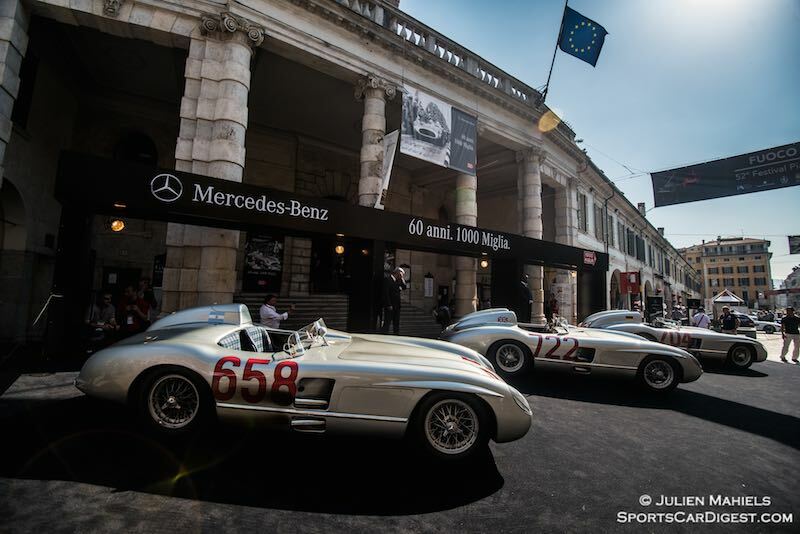 Together with the legendary Mercedes-Benz 300 SLR (W 196 S) racing car, Mercedes-Benz racing drivers Sir Stirling Moss and Hans Herrmann remembered the 1955 race at this year’s Mille Miglia event, which was held 14-17 May 2015. 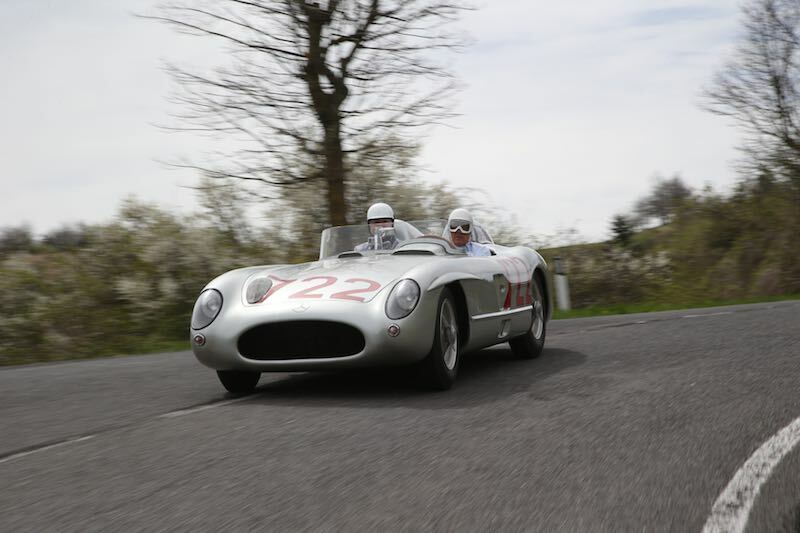 In 1955 the young Brit Stirling Moss won this furious Italian road race with his co-driver Denis Jenkinson in the fastest ever time of 10 hours, 7 minutes and 48 seconds over a distance of around 1,600 kilometres. 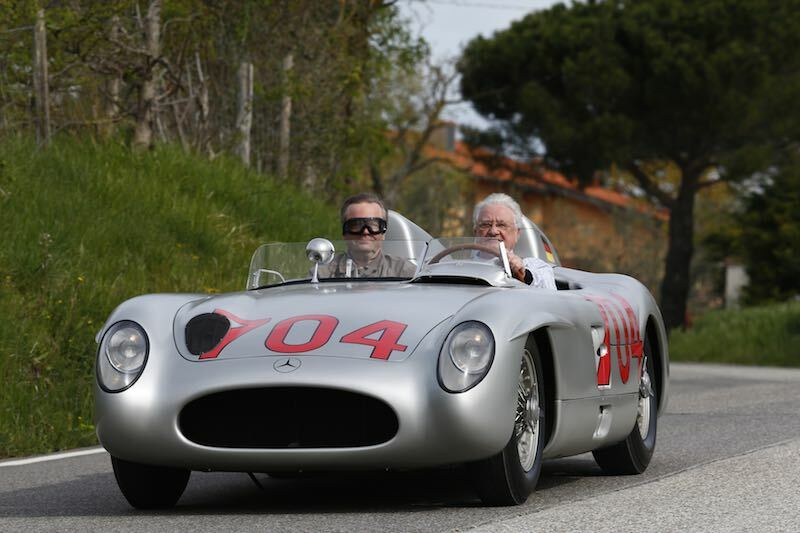 Hans Herrmann, on the other hand, was the hapless hero at Mille Miglia 60 years ago as he was in an excellent second place at the wheel of his 300 SLR, likewise with a chance of victory, when an unfortunate defect ended his race on the Passo di Futa. 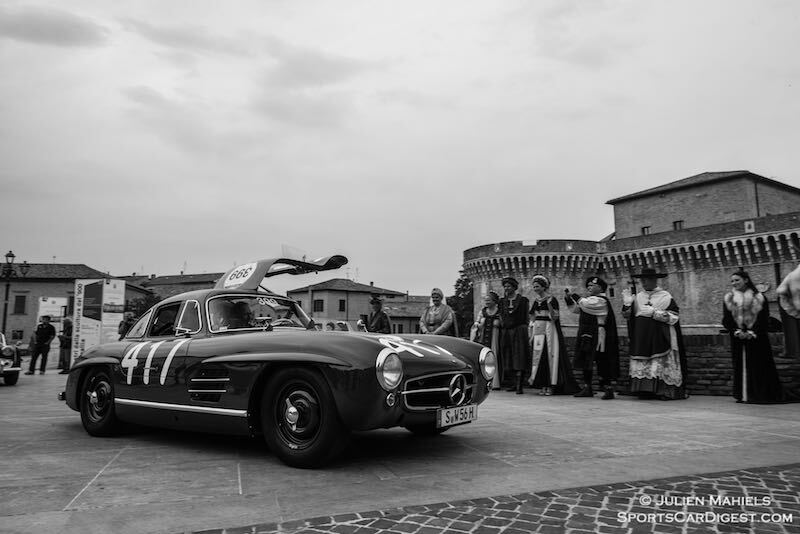 The 33rd nostalgic Mille Miglia in May 2015 kept alive the memory of the historic road race staged between 1927 and 1957. 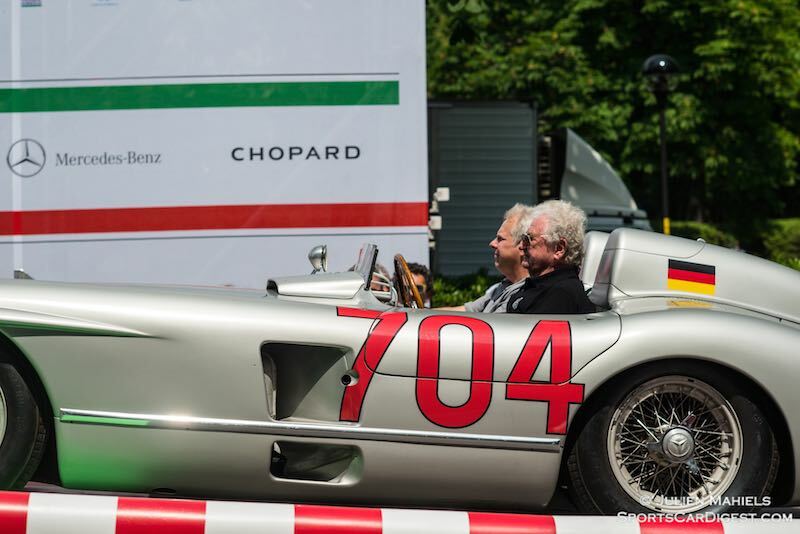 The appearance of the original 300 SLR racing cars with Sir Stirling Moss, Hans Herrmann, and Ralf Schumacher at the wheel were among the highlights of this year’s event. 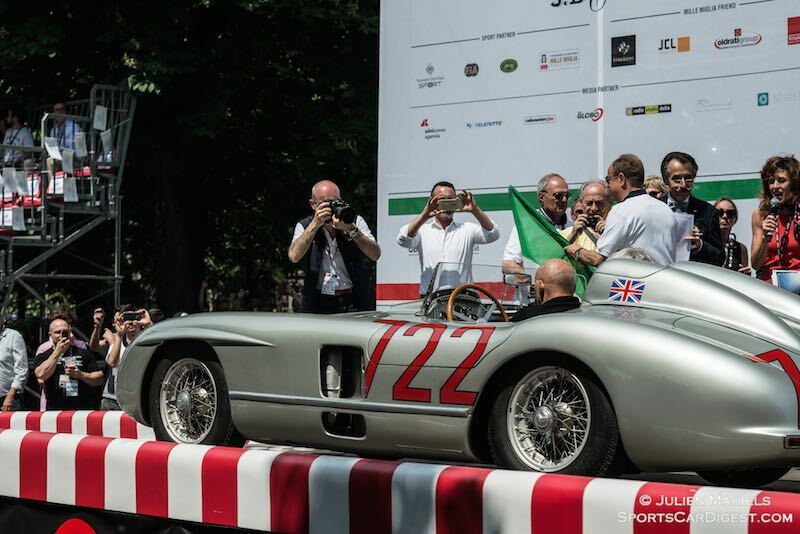 Sir Stirling Moss was a guest at the wheel of the very same original car with starting number 722 in which he won the legendary Italian road race from Brescia to Rome and back in the best time 60 years ago. Mille Miglia (Brescia/Italy), May 1, 1955. 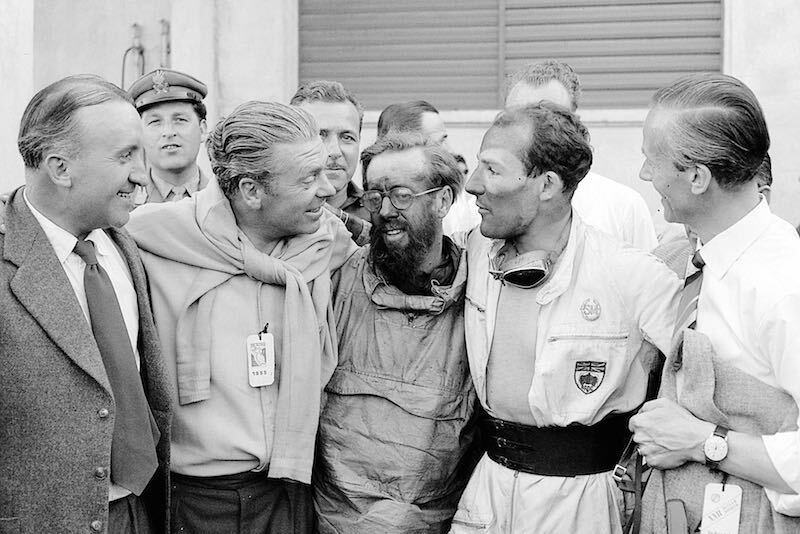 Celebrating the victory of Stirling Moss and Denis Jenkinson (from left): senior engineer Ludwig Kraus, senior engineer Rudolf Uhlenhaut, Denis Jenkinson, Stirling Moss and Dr. Hans Scherenberg. Mille Miglia, Brescia in Italy, 1 May 1955. 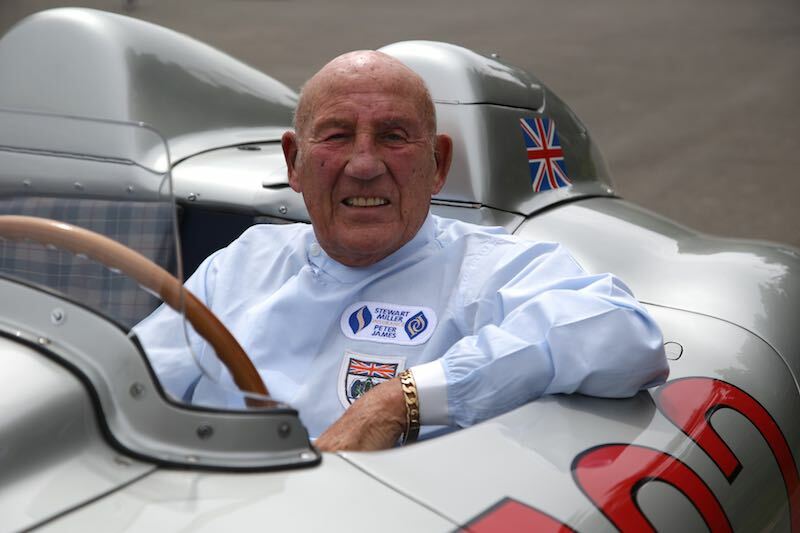 Stirling Moss and Denis Jenkinson won the race in record time driving a Mercedes-Benz Type 300 SLR (W 196 S) racing car. At Moss’ side was then team-mate Hans Herrmann – who six decades ago was likewise a hot contender for victory in the thousand-mile race. The talented driver from Stuttgart put in a stunning performance in 1955, but his race ended due to an unfortunate accident on the Passo di Futa while lying in second place. 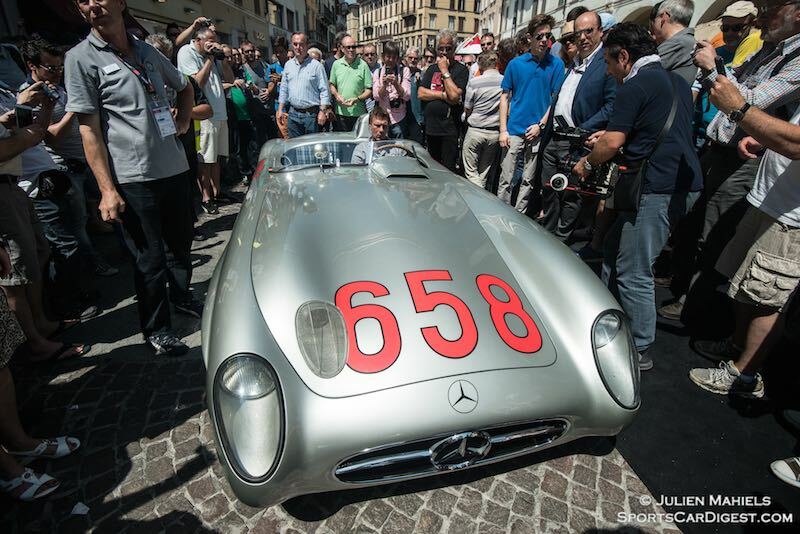 The third Mercedes-Benz driver to line up on the 2015 Mille Miglia route was former Mercedes-Benz DTM racing driver Ralf Schumacher in the number 658 300 SLR that was originally driven by Juan Manuel Fangio. 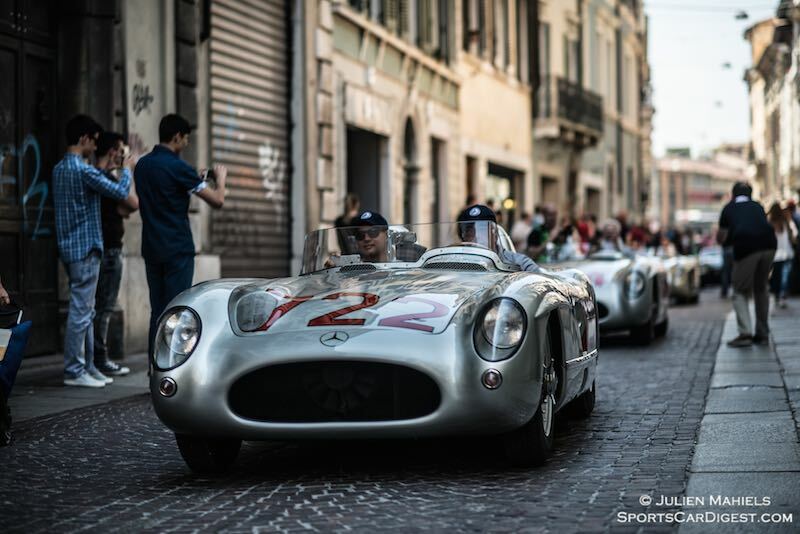 The authentic racing cars made their unique guest appearances in Brescia, Sirmione, San Marino, Rome and Siena during the course of the historic regularity race. 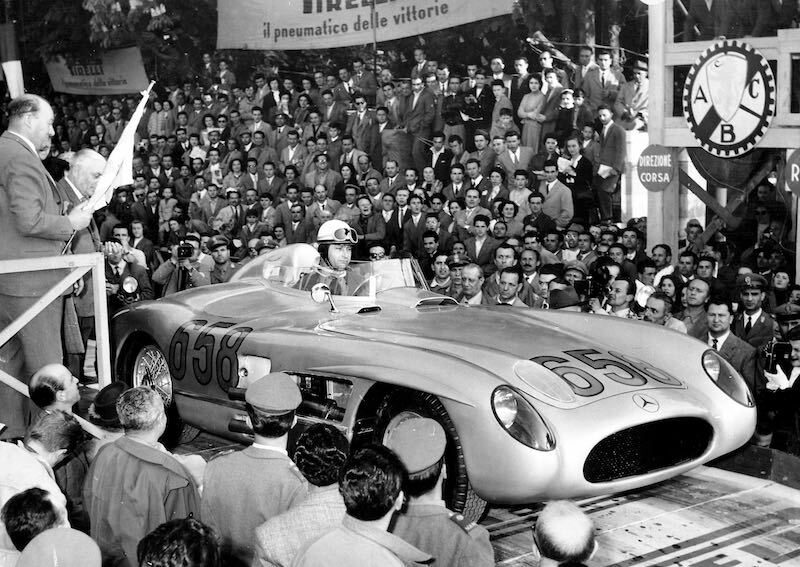 Juan Manuel Fangio (start number 658) in a Mercedes-Benz Model 300 SLR racing sports car just before the start of the 1955 Mille Miglia. Mille Miglia, Brescia in Italy, 1 May 1955. Winner in the diesel class: senior engineer Helmut Retter (Daimler-Benz representative in Innsbruck) with co-driver Wolfgang Larcher in a Mercedes-Benz Type 180 D (W 120), start number 04, at a checkpoint. Mille Miglia, Brescia in Italy, 1 May 1955. 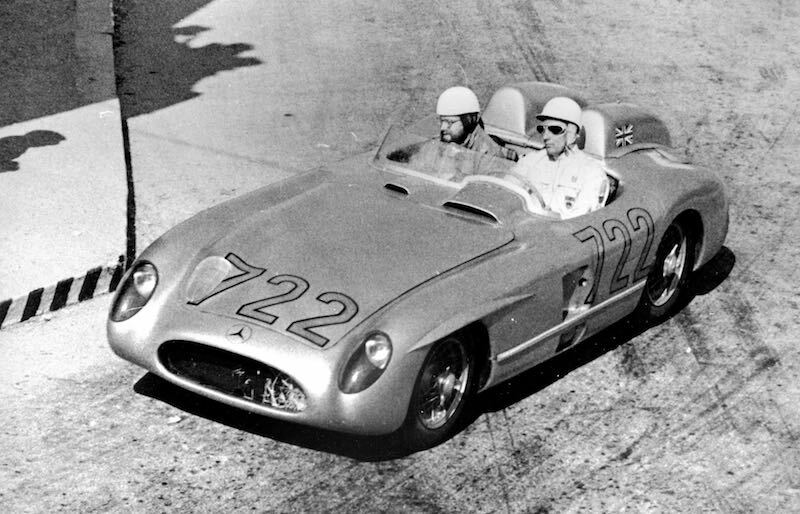 Winners in the production sports car class: John Cooper Fitch and Kurt Gesell (start number 417) in a Mercedes-Benz Type 300 SL (W 198) touring sports car. 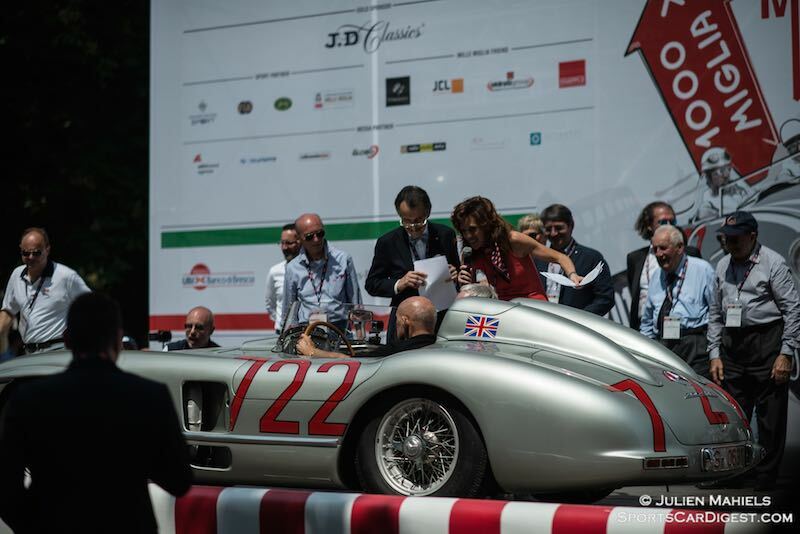 Around 430 cars from some 70 different brands took part in the Mille Miglia this year, including almost 40 Mercedes-Benz cars. 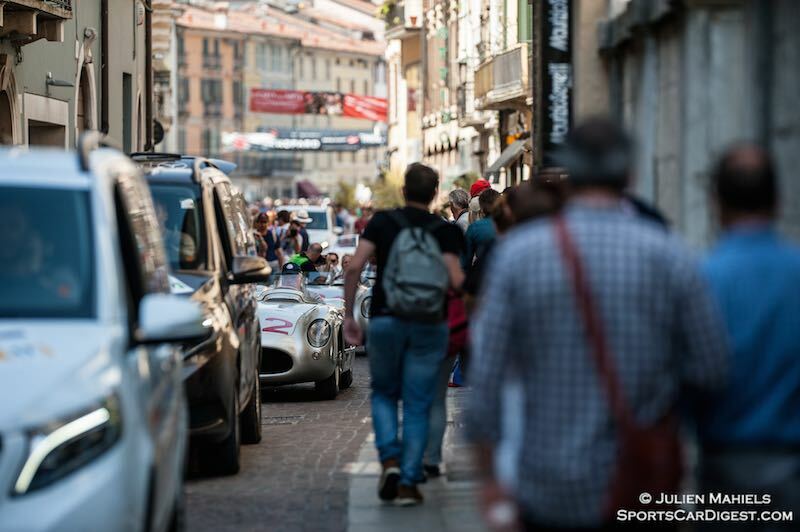 The line-up for the Mille Miglia 2015 included the supercharged SS and SSK touring sports cars from the late 1920s plus the 300 SL (W 198) and 220 ‘Ponton’ (W 180) models unveiled in 1954. 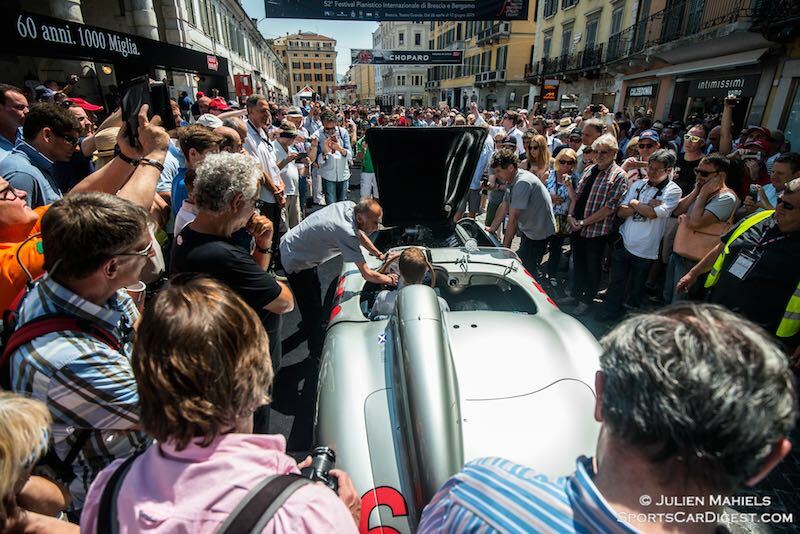 Each of the vehicles was associated with its own special moments in the history of the Mille Miglia. The supercharged sports cars, for instance, were a reminder of Rudolf Caracciola’s victory in the Mercedes-Benz SSKL at the Mille Miglia 1931. At the time, this was the first overall win achieved by a non-Italian driver. 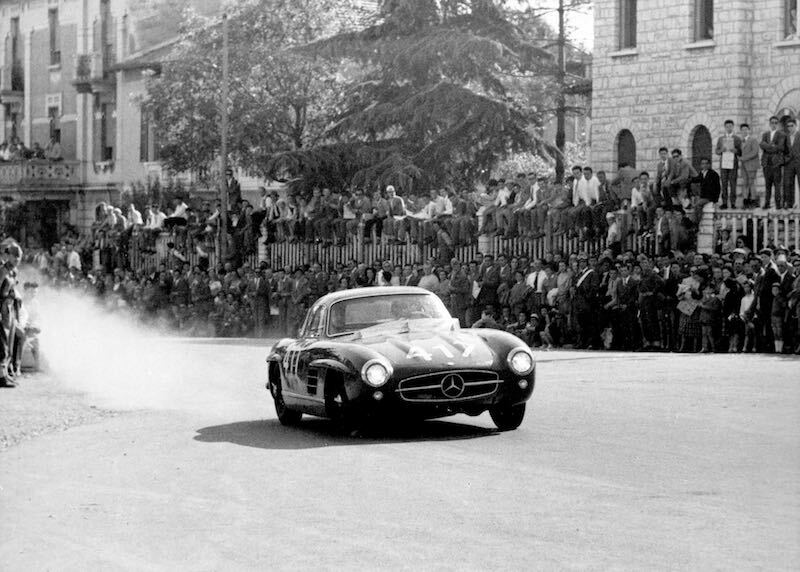 The 300 SL ‘Gullwing’ Coupe was a standard-production sports car derived from the 300 SL racing model (W 194) with which Mercedes-Benz returned to international motor sport in 1952, achieving second (Karl Kling) and fourth (Rudolf Caracciola) places overall at that year’s Mille Miglia. The standard-production sports car then enjoyed its finest hour in 1955 when John Cooper Fitch led a triple victory for the 300 SL in the category for standard-production sports cars with a displacement above 1.3 litres. Similarly the 180 D (W 120) diesel-powered Saloon achieved a triple victory in its category in 1955, adding the perfect finishing touch to the resounding overall victory achieved by Stirling Moss and Juan Manuel Fangio in the Mercedes-Benz 300 SLR. Despite the racing department’s withdrawal from motor sport, Mercedes-Benz supported the entry of several 300 SL standard-production sports cars in 1956, although the main emphasis was on preparing three 220 ‘Ponton’ Saloon models for the Mille Miglia. My greatest dream would be to have raced the Mille Miglia. Perhaps in a Maserati. 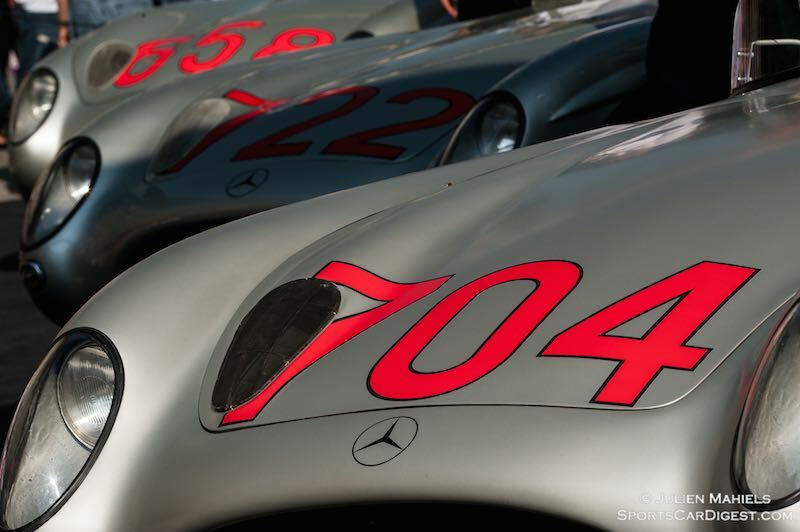 What a great history and what great drivers of the era. The original Mille is now more legend than anything (it certainly was my childhood fantasy even if I was a bit confused and always wanted to be driving a Birdcage in it) and somehow it seemed more fantastic to my young South Mississippi mind in black and white and more excitingly foreign than anything else. I was in love with the idea of being an international race car driver at ten years old (1961) and Phil Hill was my hero (still is) though not one in a hundred people in my home town even knew who he was. I still credit the inspiration of those grainy Road&Tracks in helping me see a bigger world than the claustrophobic segregationist culture I was growing up in. Thankfully I also discovered that the God I believed in was a lot bigger than the crosses burning in the night in that time. In a strange way those beautiful cars and passionate drivers and even crazy Italian fans all joined by a shared joy were a part of my salvation. Thanks guys! Ciao! P.S. I still enjoy racing an ancient MGBGT at Road Atlanta! I have to say the Fans make it great, they are truly car crazy and just love to hear engines rev, every town and village they make gestures to rev the engine ( we comply of course!). And the event is all about endurance as driving old cars on small roads certainly taxes the components!